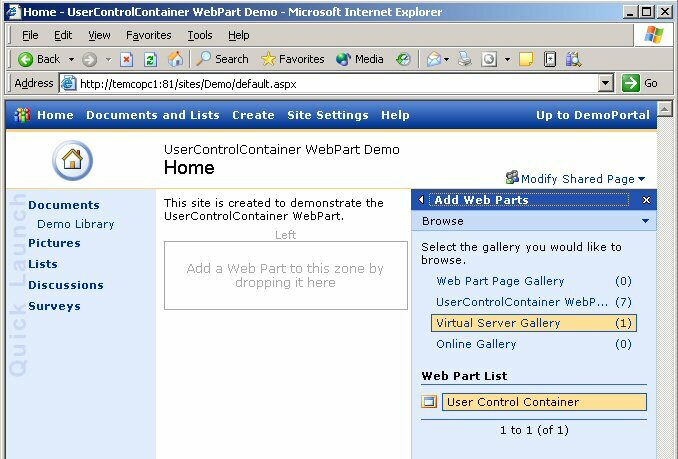 Together with Jan Tielens, I have created a improved version of my User Control Container Web Part called the SmartPart for SharePoint. Jan has written an introduction and even created a video demonstrating it in action. We have created a GotDotNet Workspace for the SmartPart. Over there you can download an installation package that will install the SmartPart, the source code and an example user control. At this point there isn’t very much documentation, but I will work on that. :-) There are a lot of cool ideas which (I hope) will be added to the SmartPart (for example a connectable SmartPart). I’ve IM-ed with Patrick today and he has another cool idea which he discussed in one of his latest posts: using the User Interface Process block together with web parts. Anyway, some nice ideas are waiting to be implemented! SharePoint is a great product. In this article I will demonstrate this by creating a Web Part which acts like a container for normal ASP.NET User Controls (.ascx files). This makes it very easy to customize a portal page by adding normal ASP.NET User Controls to it. 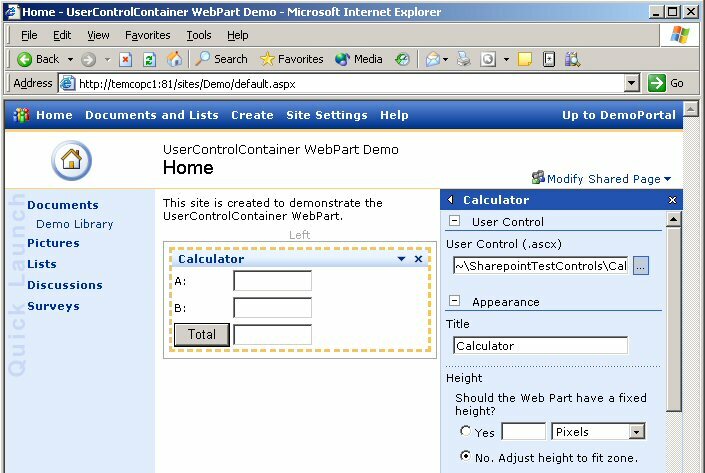 The UserControlContainer Web Part is created using the Web Part Templates for Microsoft Visual Studio .NET. The real magic in the UserControlContrainer class happens in the CreateChildControls() method. In this method the User Control is loaded and added to the Controls collection. The RenderWebPart() method renders the User Control to the HtmlTextWriter. STSADM is a command line tool in SharePoint which can be used to install the Web Part package. A Web Part package is to be created in the form of a CAB file. You do this in Visual Studio.NET by adding the DWP file (C#'rs.. make sure your DPW file is marked as content file) and the DLL along with a third file, the manifest.xml (which is normally there if you started from the Web Part template) to the CAB file. The manifest will contain the registration of the safe control that needs to be done in the web.config. Updates can now easily be done by recompiling your projects and simply double-clicking the install.bat file or for the C#'rs call it as a post-build event. I will demonstrate the usage of my web part using a simple Calculator user control which can be used to calculate the sum of two numbers. The control is just a normal UserControl which I created using Visual Studio.NET. I have copied the calculator.ascx file to a new folder called 'SharepointTestControls' in my portal, in my case c:\inetpub\DemoPortal\SharepointTestControls. I have placed the SharepointTestControls.dll which contains the compiled codebehind class in the 'bin' folder of my potal, in my case c:\inetpub\DemoPortal\bin. /// Summary description for Calculator. You can use the User Control Container Web Part by adding it to your page. In my example I have added it to the Left zone. Next I have set the User Control property to '~\SharepointTestControls\Calculator.ascx' and changed the Title into 'Calculator'. 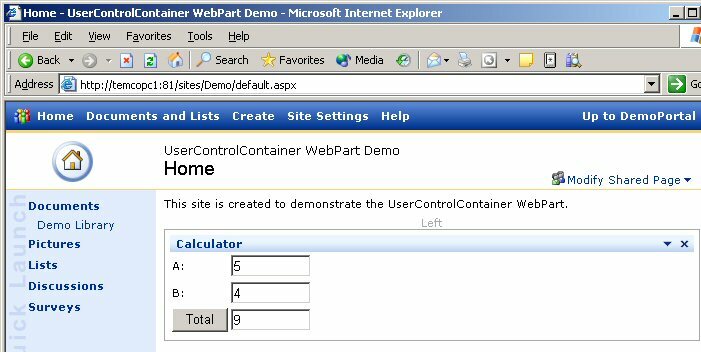 The Calculator UserControl now lives inside the UserControlContainer WebPart. When you enter two numeric values into textboxes 'A' and 'B' and click the 'Total' button you will see it really works. I learned a trick from Mads Haugb?? Nissen which makes this WebPart even more powerfull. You can create an separate DWP file in which you predefine the value for the UserControl property. This way you don't have to set it manually. Finally you must copy the calculator.dwp file to the 'wpcatalog' folder of your portal, in my case c:\inetpub\DemoPortal\wpcatalog. 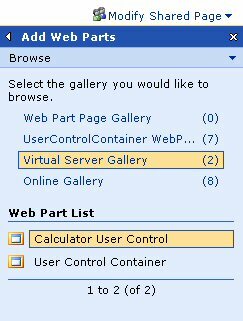 The Virtual Server Gallery will show the Calculator User Control as if it was a normal WebPart. This makes creating WebParts very easy. Microsoft SharePoint Portal Server and Windows SharePoint Services is, in combination with the VS.NET and FrontPage 2003, an excellent development platform for building custom portal sites. I hope this article gave you an impression of how easy it is to add User Controls to a portal page.